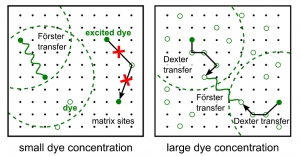 The triplet-triplet annihilation (TTA) rate in organic phosphorescent materials such as used in organic light-emitting diodes is determined predominantly either by the rate of single-step Förster-type triplet-tripletinteractions, or by multi-step triplet diffusion. We show how kinetic Monte Carlo simulations may be used toanalyze the role of both processes. Under steady state conditions, the effective triplet-triplet interaction rate coefficient, k TT, which is often regarded as a constant, is found to depend actually on the number of excitons lost upon a triplet-triplet interaction process and to show a significant higher-order dependence on the triplet volume density. Under the conditions encountered in transient photoluminescence (PL) studies, kTT is found to be effectively constant in the case of diffusion-dominated TTA. However, for the case of single-step TTA, a strongly different decay of the emission intensity is found, which also deviates from an analytic expression proposed in the literature. We discuss how the transient PL response may be used to make a distinction between both mechanisms. The simulations are applied to recently published work on the dye concentration dependence of the TTA rate in materials based on the archetypal green emitter tris[2-phenylpyridine]iridium (Ir(ppy)3).